Six years ago my daughter Jennie and I moved to St. George, Utah from California. My daughter has Down Syndrome and was 27 years old and had been in special education classes all of her life. At this time I was introduced to the NACD organization and Sara Erling. Jennie has been blessed to be able to be a beautiful dancer over the years. She has a natural ability to express herself on stage. I saw she was talented and that is was what I concentrated on for her during her growing years. She entered many dance competitions and danced with normal dancers. She has won many trophies. During her growing years although her special education teachers cared about her and were wonderful dedicated people they did not have the skills to bring out the best in Jennie. Our special children can learn to read, can write their names, learn math and be of service to those around them. One of things I have learned from Sara is to keep my expectations high for Jennie. Even though Jennie has this special talent for dancing when she started with NACD she couldn’t read, print her name, read words, do math, or talk in 3 to 4 word sentences. Today she can read, print her name, read words, do simple math, and her talking has increased 75% especially in sentences. She plays the piano, learned to use an iPad and cell phone. Along with all of this academic growth has come her ability to do chores and to help me around the house or grocery shopping. Jennie loves to help. When she wakes up she gets herself dressed, says prayers and then starts on her chores. I never have to force her to do these things. Her chores are to put her dog outside for a potty break, pick up dog poop, empty the dishwasher, put our vitamins out on the counter for me to put together, prepare her favorite Crystal Light orange drink, take her vitamins, vacuum the whole house, and then start her NACD program that I have on her iPad. I do not have to force her or remind her to do any of these things. She is also wonderful about getting me things I need and never complains when I ask her to do that for me. Jennie is now 33 years old and is continuing to grow, learning at a faster pace and that is all because of the NACD program. I see things all the time that are new that she can do. For example, we were in the car and I asked her something about stop lights. She paused and said “I don’t know” and I said “then I will teach you”. I watched her start her NACD program on her iPad and then asked her to do something for me. Her first thing on iPad is Smarter Kids and she sets the timer for how long she is supposed to do it. Since I interrupted her, I saw her go over and stop the timer so she would still get the right amount of time for her Smarter Kids program. We are LDS (Mormon) and we are temple-going people. 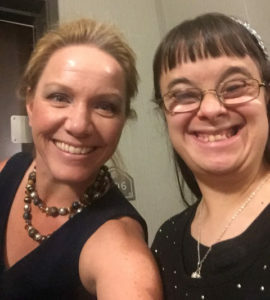 Not all Down Syndrome adults are capable of attending the temple and to do service in the temple, but because of Jennie’s growth and excellent behavior, she was approved for a temple recommend and we go every Wednesday. On a recent trip to the temple, I saw her multitask. She was reciting to me her testimony she had been memorizing, then on her own took out my wallet (which is broken), took off the rubber band and took out our temple recommends and then closed up my wallet, put the rubber band back on and put it back in my purse and during all of this never missed a beat practicing what she had memorized, which was her testimony of her faith. I am seeing things like this happen all the time and that is because her brain is growing. NEVER tell me that any of us are too old to learn and grow. Concerning pets and our children, they are very important. Jennie was given a miniature Schnauzer dog and she has been like a therapy dog for her. She has helped in increasing Jennie’s ability to talk in sentences. Our children can have many health problems. Jennie has had a hearing loss all of her life. Three years ago she was diagnosed with celiac disease. For three years now, she has been gluten free and it took three years to get her numbers down. In June she was approved for a cochlear implant hearing aid, but when they did another hearing test her hearing had improved by 75% and I feel that is because she has been gluten free for three years. She still has some hearing loss but will be reevaluated for the implant in December because she is borderline on needing it now. The doctors say she probably has had celiac most of her life and that Down Syndrome children tend to have celiac disease. The one thing I know is that anything we put in our children’s mouths can affect everything in their lives. When I was in the sound booth with Jennie this time, I saw that my daughter could hear. In closing, I want to stress two things. First, our children are never too old to start the NACD program—never stop working with them. Second, for those with young children, do not give up. If I had done the NACD program with Jennie when she was young, I can only imagine where she would be today in what she could accomplish, but I am so excited with the progress she has made in the past six years. I have had the privilege of working with Jennie and her mother Roberta since they started the NACD program six years ago. The biggest thought that comes to me when I think of Jennie is that it is never too late to improve one’s function, therefore significantly impacting their quality of life. Since being on our program, Jennie has come out of her shell. She is communicating and understanding so much more. As a result, she has been able to participate in her church and her community. Jennie is also able to take care of her mother. When they started our program, Roberta did everything at home, while Jennie was not able to help. Jennie has grown so much in her independence and her ability to not only take care of herself, but others. Roberta is amazing. At 80 years of age, she has worked so hard with Jennie to improve her function. She has learned to read and write, and be aware of what needs to happen in the course of a day. We opened Roberta’s eyes even more to the possibility of what can be and that if you put the right input in, with the right frequency, intensity, and duration, then the brain can change. For those of you that have adult children who live with you and whom you know need input, know that it is not too late. You can improve their life and your own.